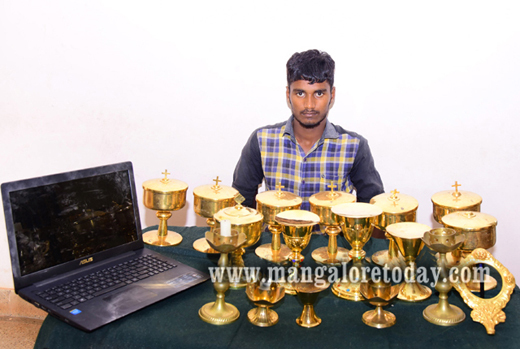 Mangaluru, Dec 18, 2015 : One more person wanted in connection with the recent theft at Pajir Church has been arrested on December 17, Thursday. The accused has been identified as Abdul Jaffer (19) from Pavoor Akbarnagar. He was also wanted in the case of theft of mobile phones and other goods from a mobile and fancy store at Derlakatte. The police could zero in on Jaffer on the basis of the revelations made by Afreez, Mustaq and Azharuddin arrested by the police in connection with Pajir church burglary case. Police are on the lookout for three more persons wanted in the case. The insane thoughts have put them behind the bars. Jaise karni waise bharni.